Mobiles That Make A Statement In Open Spaces! 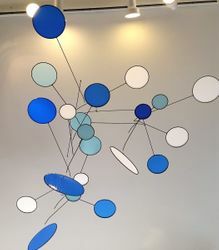 Our most popular larger Tri-Lumen hanging mobile is created by combining 3 single Lumen hanging mobiles together to transform into a colorful, multi-piece and impressive work of kinetic art. The physical composition incorporates 21 individual armatures and vanes, each moving 360 degrees - independent of one another with overlaping shapes hovering horizontally over the viewers perspective.